That the engine will not let you down. After 150,000 miles on my Element engine, it doesn't blow smoke of any kind or color nor are there any puddles of any types of fluid on the driveway where I park. This is a fantastic vehicle and I don't understand why they quit making them. The individual seats in the back can be folded down in so many different configurations and/ removed if need be. Also, the engine has to be one of the best in the world. I have over 150,000 miles on my Element and it doesn't leak any fluids nor are there any puddles under my Element. I really wish they would bring it back into production. The doors open up all the way, as in you have a suicide door in the back seats. The rear opens into a clamshell configuration, plus you have a sunroof between the rear seats and the rear cargo area. No one lacks for space in this vehicle. Bring it back Honda!!! I have had no problems with this car, beyond it is normal maintenance, until last year. I have had it since 2003, so that says a lot. It converts to a camper vehicle. Lay down the front and back seats and you have a double bed. Put up the back seats and it is like a cargo van and transported my two large golden retrievers around the country. The back seats can even be removed for more space. It is good on gas/mileage and is not a bad ride even after all these years. Honda's have been reliable cars for me with few maintenance issues. It looks small from the outside, but has so much room and very flexible. 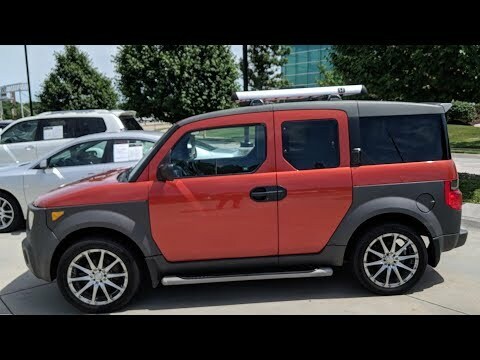 The Honda element of 2003 is reliable and is good for a small family or one person. While it looks small, there's plenty of room with movable seats to adjust when needed. The car's performance is amazing and has run smoothly for me for about 4 years now. The only small complaint would be that the muffler tends to break and I have noticed that other Honda elements have that same issue. Besides that, I am comfortable with my car and wouldn't give it up.